Get your logo printed - Koozie 18 Can Elegant Promotional Coolers. 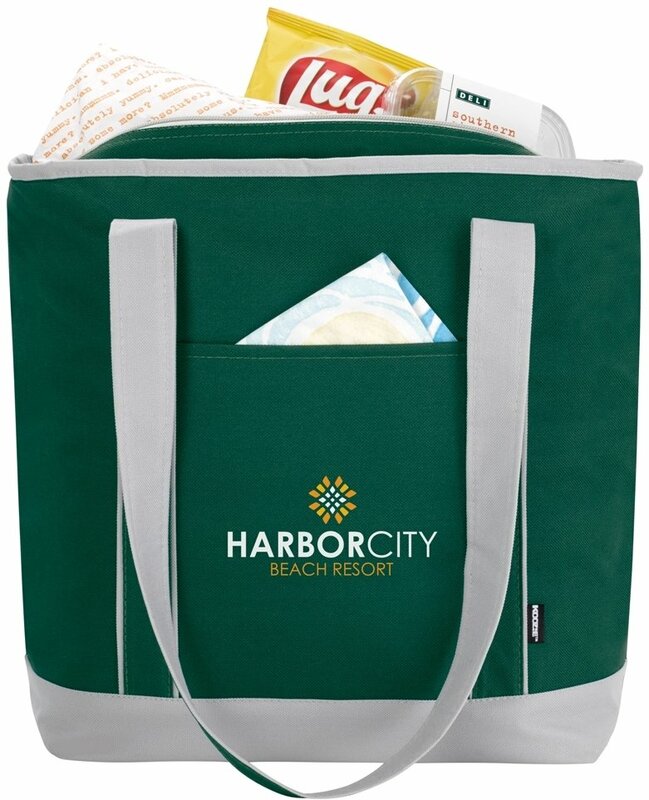 Your promotional items for Ladies, hotels, resorts & conferences. liner, zipper top, front pocket, stylishly stitched & carry handles. Overall size is 16 7/8 w x 14 h x 5 3/4 deep. 6 tote bag colors. Colors: Hunter Green, Orange, Navy, Red, Royal and Black. Frigid Ice Packs, $.79 each, order in whole lots of 36 packs. You MUST order this cooler in lots of 20 units over the min. Delivery from date of a order for this product is 2-3 weeks. Rush Production add $50 w/ a one color imprint ONLY. Price includes a one color imprint on front area 5 1/4" w x 7" h.
I was tasked with finding a gift with our logo for an upcoming conference and I looked no further than PII when I found this Koozie cooler tote bag. The green was exactly what we were looking for and the imprint was wonderful. Delivery was on time and our rep was professional in all his ways. I highly recommend Promotional Items.